The chain-reaction of foreclosures, mortgage company failures, banking sector woes, and see-sawing stock market are making for a very scary-looking retail season here in the fourth quarter. The U.S. Department of Commerce recently said that business sales have dropped the largest amount in two years, further fueling speculation that the holiday shopping season might not be so rosy this year. However, all is not dark, and the nervousness that consumers are feeling right now may be tapped to effectively help improve one’s business right now and for the long-term. I’ve got a marketing tactic that can help with search engine optimization while simultaneously bumping up sales and even store visits for local brick-and-mortars. Read on! 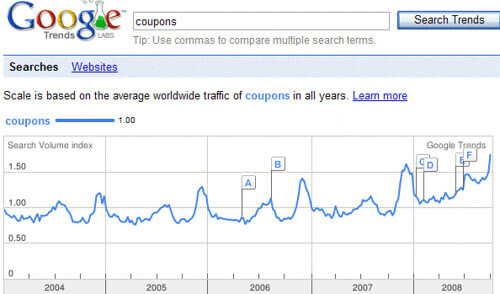 My secret local search engine optimization tip du jour is exquisitely simple: coupons! The potential for tapping into this consumer hyper-interest is remarkably clear! People are going to more effort right now to research deals, discounts, rebates and coupons before they make purchases, so if your business site has content of that sort, you may be able to achieve additional sales. Even better, the coupon content can be a good magnet for obtaining external links, so having coupon and other discount pages can help with your search engine optimization. Getting good quality links from other sites helps to increase your PageRank and will therefor help improve your pages’ rankings in all search engines. There are a number of coupon directories sites out there which love to list deals and may link to you. While some of these may only list coupons if you pay them as an advertiser, there are sites out there which may list your coupons for free. Consumer blogs seem to be springing up all over, focusing on reporting best prices and discounts — some of these are even local city or regional blogs, specializing in particular geographic areas. If you put up a coupon page, do some searches in regular web search and blog search to find sites which might list your coupon and link to you, and report your coupon to them. Don’t be afraid to ask various organizations and blogs which report on deals to link to you. You could even research local clubs and associations which post their newsletters on-line, and you could offer their members a special coupon with a link to a specific info page on your site, outlining the deal. Even advertising on some of the coupon directories could be useful to you, depending on what your product or service is, although some coupon directories are not accepting further partners at the moment. Link to the coupon page from your homepage. Promote it on your homepage, even — display a small thumbnail of the coupon, and have linked text below that reiterates the coupon’s title. Make the coupon “meaty”! There’s nothing more irritating than coupons for the stuff that no one buys, or coupons that are so insipid that they only bring your price down to what everyone can get at the corner discount store. It’s hard to tell whether a blog is essentially a “sham blog” made up of all paid article content. So, some blogs which appear to be on the level may come back asking you for money in return for posting your coupon information. Pay-for-blog posts of this sort can be frowned upon by search engines, particularly if they’re not clearly labeled as sponsorships. I’d recommend avoiding these, since the search engines may have discounted the worth of their links anyway, and I think they typically have fewer subscribers/readers. Always include expiration dates in your online coupons. Just to keep them live through this holiday season, you could have them expire on January 1. Or, have them expire more frequently if you’re planning to put up new promotions — churning your promotions could result in more links. Ask people to print and bring in the coupon — this will let you get an idea of just how effective this promotion is. Provide links to the top most popular items you might sell on your site, below the coupon information. The coupon might draw people into your site, but don’t waste the opportunity to show them a few other things they might also buy. Limit to only two or three items, though! Ask people to rate your business or your product at one of the big ratings sites out there, such as internet yellow pages, in order for them to qualify for the coupon. Positive ratings can help your site to rank in local and regular web search! State outright that the review doesn’t have to be positive, but that you’d appreciate honest feedback in order to represent your business well and to obtain input in how to make improvements. You could ask them to write on the coupon the name of the site where they reviewed your business in order to validate the coupon. It’s not a good idea to reward people for only good ratings, or the host sites might take a dim view of the promotion — but, incenting people to give objective ratings should be acceptable. Also do not require that they write their usernames on the coupons. Always include your URL on print advertising, including printed coupons. To further engage holiday sentiment, offer to make a donation to a well-known charity for each coupon purchase, and outline that deal on the coupon webpage as well — and invite people to email the page link to others they know. Consumers will be more supportive of businesses which are supportive of their communities, and this can also help to attract more links as people report on the deal. When doing charitable tie-ins of this sort, it’s also worthwhile to coordinate an optimized press release announcing the program and linking back to the coupon page. Offer a “serial coupon”, such as if the consumer makes purchases on three successive visits, they qualify for increased savings each time. This could really pump things into overdrive! Don’t make the fine print of the coupon so extensive that no one can comprehend the exclusions. People know what “bait and switch” is, and they really hate it. Avoid anything close to that such as luring people in by ambiguous language and stuff. Do this wrong and you can turn people off and lose potential longterm customers. Be darn sure you have enough product for everyone who might bring the coupon by your store! There’s nothing worse than getting excited by a coupon only to find the store ran out. The economic crunch has caused many businesses to keep much smaller inventories, but try to be prepared to rapidly reorder product if your coupon promotion appears to be working. Using a good coupon strategy this season can allow you to take advantage of the hot consumer interest in discounts. Use this opportunity to get some great inbound links for your longterm SEO benefit, while also pumping up your short-term sales. Chris “Silver” Smith is a Search Marketing Consultant and writes for the Locals Only column at Search Engine Land.